Our last CG Realtors Spotlight featured a Claremont community staple in Claremont Craft Ales. This week we shed some light on proper men’s fashion, suits. 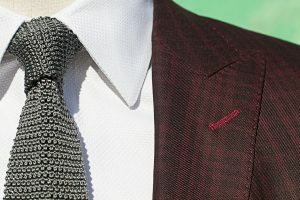 Christian Roche’s Bespoke is a custom made to order suit service that provides the highest quality materials and fabrics and pairs that with an intensive eye for attention. As a young man Christian’s obsession with men’s fashion led him down the path he continues to walk this day. Christian works intensely with each individual client to understand their day to day life and habits in order to construct a suit designed to fit the individuals every need. Christian knows the work schedule can be busy so he prides himself on meeting the schedule of his clients and drops by anywhere and anytime to perform his job. His goal is to show men everywhere that buying a custom suit should not be a fearful endeavor. Just watch the video below and see just how easy and pain-free getting a custom suit really is. For more information visit Christian Roche Bespoke.